I'm sorry, did I ever ask you for a GD? Seems like I can't remember it. 00:10:180 (10180|3,11068|2) - Switch these columns for pitch relevance. 00:11:402 (11402|1,11513|0) - Move these to (3,2) in accordance with the previous change. 00:12:735 (12735|2) - Move to 3 and 00:12:846 (12846|1) - to 1, again, for PR. 00:20:846 (20846|1) - Move over to column 3 and move 00:21:513 (21513|3,22179|3,22846|3,23513|2,24179|2,24846|2,25513|3) - over to columns 1 and 2 respectively. 00:28:846 (28846|3,29179|2,29513|1,29846|0) - You can change these to 1/3 spam, the buildup feels to empty without it. 00:38:846 (38846|1,39179|2,39513|3) - Ctrl-H and move them over a column, as a result also move 00:39:846 (39846|1) - over to column 4. 00:43:068 (43068|2) - Move over to 1 for hand balance. 00:50:179 (50179|3,50846|2) - Switch these columns. 00:55:513 (55513|3,55846|0,56179|3,56513|0) - Ctrl-H these to make 00:55:179 (55179|2,55291|3,55402|2,55513|3) - and 00:54:513 (54513|1,54624|0,54735|1,54846|0) - have that sweet sweet symmetry. 01:24:179 (84179|0) - Move to column 1 for hand balance. 00:26:179 (26179|3,26179|2,26513|0,26513|2,26846|3,26846|0,27179|3,27179|1,27513|2,27513|1,27846|2,27846|0,28179|0,28179|3,28513|1,28513|2) - This section is identical to the NM, there are some 1/3rd sounds around 00:27:291 - and 00:28:624 - you can map to distinguish the diffs. 00:48:068 (48068|1) - Move to column 1 for better hand balance. 00:51:513 (51513|2,51846|1,52179|0,52513|3) - I kinda like the idea of these being 2/3, or even 1/1 LNs for the weird held sounds here, but this is optional. Grab some more opinions before calling me back. nop, as you can see on entire section I always use triple for cymbal (like this 00:31:513 (31513|1,31513|0,31513|3) - this 00:42:179 (42179|3,42179|0,42179|1) - and this 00:47:846 (47846|2,47846|0,47846|3) - ) and double for any sound like this 00:37:513 (37513|0,37513|1) - . I wanna keep them consistent. But I applied anything else you mentioned, thx! 00:20:735 (20735|0) - that would be a better idea to put the LN on this note instead: 00:20:846 (20846|2) - cause in terms of playability, it will be more interesting to play, and also more intuitive. 00:26:179 (26179|2,26179|1,26513|0,26513|2,26846|3,26846|1,27179|3,27179|0,27513|2,27513|0,27846|2,27846|1,28179|3,28179|1,28513|3,28513|0) - those notes' placement isn't really intuitive for the player in my opinion. try something like this https://i.imgur.com/Q4qj65W.png to make it look cleaner and appropriate to the song. 00:30:513 (30513|1) - delete this note, cause that's not following any important sound in my opinion. actually it's based on this note's reverb 00:30:402 (30402|2) - so that's not important to keep it for an NM diff. 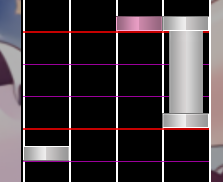 00:36:846 (36846|0,37179|3,37513|2) - in my opinion, forcing the player to hold the column 1 and 4 while clicking at the same time on the column 3 looks pretty hard for an NM diff. so i would suggest to remove that LN. 00:41:846 (41846|0,41957|1,42068|0) - for playabilty, i recommend you to invert the column of those notes. like this: https://i.imgur.com/1rmuh4B.png that plays a way better, and it's still emphasizing the sound you're based on. 01:03:179 (63179|3,63291|2,63402|3,63513|2) - this pattern might be pretty hard to play for a usual NM diff player. so try to avoid using the same column in a short period of time, to avoid exhausting player fingers. 01:07:513 (67513|1,67846|2) - why you're not following the melody you used to follow previously? i think that's pretty important to have focus on them. 00:28:846 - this is probably the only serious problem I had with this map. For this slow speed, it feels pretty unintuitive to have a four-note pattern in a three-beat rhythm. I would suggest using a three-note pattern like 4-3-1-4-3-1 etc. Been a while since my last modding. 01:31:402 (91402|2) - extend to 01:31:846 (91846|1) - ? 00:12:179 (12179|2) - this note is un snap. 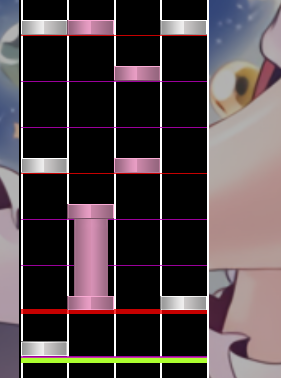 Before starting the mod, I just wanna let you know that the mod will be almost based in note positions rather than pattern structure because the difficulties of this beatmap isn't too high to have really complex patterns. 00:10:180 (10180|2) - I would move this to 2. Why? Well, as you can see you've set 00:11:513 (11513|2) - on the same place as the one I mentioned and It does have a different sound so I would put them in separated columns. 00:16:846 (16846|0) - Move to 3. The reason is basically the same thing like before. You do have 00:15:513 (15513|0) - in the same position. 00:19:513 (19513|1) - Same thing here, move it to 3 and change 00:20:179 (20179|2) - to 2. 01:15:179 (75179|3) - It has taken me a while to listen carefully to this hitsounded note that sounds like a bell and I figured out that you have skipped a few of this at the beginning. 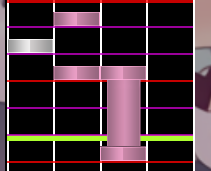 Pretty sure the reason was to make it balanced density wise, but I'd keep an eye on this things throughout the map. And I think that's all, apart from everything I said it looks cool for me. I was about to mod the HD difficulty but it actually looks really solid in every single way. I really love the structure, plus some technical patters such as light minijacks at the kiai time along with the scratch sound which looks super nice. I would say that HD is actually good to go. With everything said, I hope you rank this soon. Good luck! 00:34:513 (34513|1) - Probably the only part where the notes weigh more for the right hand compared with the other parts ahead. Move 00:32:068 (32068|2,32179|1) - to the left once. 00:34:513 (34513|1) - TBH I can't seem to make sense how you layer the notes. It's as if you want to layer double at 00:33:068 - for being an obvious lead but then you dropped it at 00:33:402 - and make it single instead. It's a pretty inconsistent layering. Either keep doing one note per sound or make sounds like 00:33:402 - double for being lead too. 01:14:735 - I'm still confused about your layering. At some point you layer the bass and the next time you don't. It occurs in the same measuresets ( 01:17:402 - for example) so I don't really think it works as a pattern variation. You need to be consistent on what to follow and what not. 2nd part is the same so I think you know the drill. 00:12:735 (12735|1) - You can move this to |3| since previous patterns ( 00:12:068 - and 00:12:402 - ) players need to alternate their hands when playing. 00:29:291 (29291|2,29957|2) - You can move these to |2| for a pretty balanced pattern for Novices and also filling the other column so it wouldn't be completely empty. 00:32:846 - are different compared to 00:35:513 - and 00:43:513 - and that bugs me a lot hahah. Just stick with one kind of layering so Novices can adapt with the rhythm pretty well. 00:41:846 (41846|1,41957|0,42068|1) - I would really suggest you to avoid doing this kind of thing one-handed as it would be hard for Novices to play. Well there are so many of this in the next sections so I would suggest you to do the same for the next occurence. 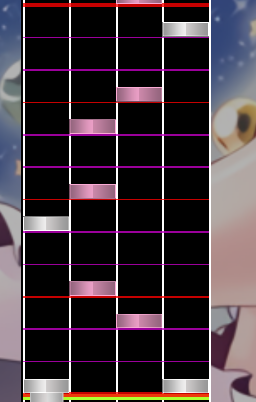 01:32:624 (92624|0) - Would suggest you to delete this for a simpler rhythm. 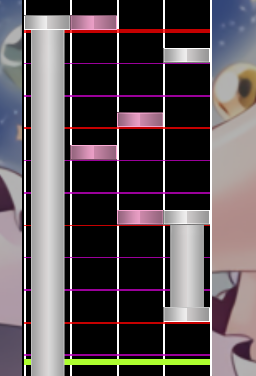 01:32:735 (92735|3) - The LN should starts at 01:32:846 - and the normal notes should be placed at 01:32:735 - since that's how the melody in this section works.